This Jim Shore collection of princess figurines features hidden compartments with secret charms. 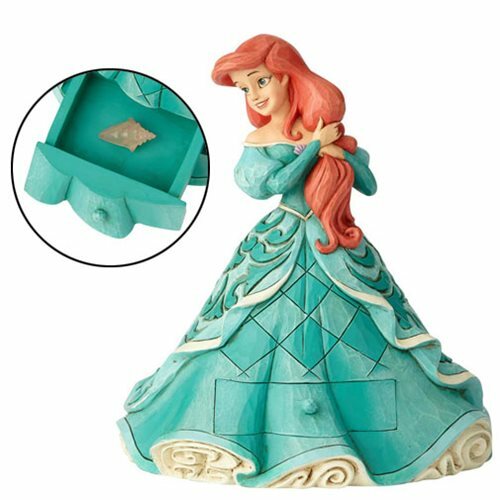 Intricately sculpted from stone resin and hand carved with rosemaling and a quilt pattern, this Disney Traditions The Little Mermaid Ariel with Shell Charm Statue by Jim Shore shows the undersea princess in her turquoise ball gown, detailed with a pull-out drawer that opens to reveal a miniature shell charm! The 6 1/2-inch tall design is hand painted by a team of skilled artisans for a flawless finish befitting its royal subject.